Yes, the economy crashed. Yes, your home’s value is down. Yes, things kind of stink right now and have for while. Yet, there is a light at the end of the tunnel. The economy will slowly recover and so will the value of San Francisco real estate. In fact, even now, many listings for sale in San Francisco receive multiple offers from ready, willing, and able home buyers. Just last week a Bernal Heights home for sale north of Cortland Avenue received 3 offers and is in contract over the asking price. Why? Because San Francisco has more housing demand than supply. Even in the worst economy in decades, San Francisco real estate trudges on and out-performs almost any other real estate market in the country. A lot of housing bears quote the Case Shiller Home Price Index to support their claim that we should all abandon the American Dream and just rent. (Wait, wouldn’t the landlord be living the dream, then? Someone’s gotta own it. 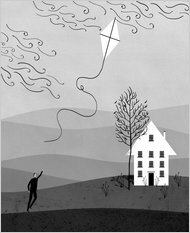 But, I digress…) So, when I came across this NYTimes Op-Ed on the intrinsic positive values of home ownership, A Dream House After All, by none other than Karl E. Case, the co-creator of the Index, I had to rejoice and of course, post about it! This financial crisis has made us all too aware that we live in a Catch-22 world: the performance of the housing market drives the economy, and the performance of the economy drives the housing market. I know we’re not supposed to “sell” on a real estate blog about San Francisco real estate but I just can’t help myself on this one. If you have a good job that you like, have some money in the bank, and think you may stay in San Francisco for the next 5+ years, you really need to consider buying a home. Rock-bottom real estate prices (relative for San Francisco – a world-class city), rock-bottom mortgage interest rates, and a recent uptick in fear in the media = the best housing affordability San Francisco has seen in a long, long time. This is the time for San Francisco first time buyers and those who already own a starter home and are looking to trade-up. Will you get a 3 bedroom single family home for $500,0o0? No. But will you get the $1,500,000 home for $1,300,000? Yes. And the $900,000 condo for $775,000? Yes. This is a time for “value-conscious” home buyers. Search ALL San Francisco homes for sale. More accurate than Zillow, Trulia, RedFin, etc.